It was a frustrating day for Chelsea as they drew 0-0 with a stubborn Everton side on Remembrance Sunday. On the day of the 100th commemoration of the end of the First World War, the Blues faced the Toffees in the early afternoon kick-off. After seeing off an unlucky BATE team 0-1 in Belarus, it was surely time for the Blues to get back to convincing winning ways. Eden Hazard got some good game time on Thursday night, completing over an over hour’s worth. Previously the Belgian missed the last three games apart from the last victory against Crystal Palace where he returned as a substitute. Chelsea lined-up with Azpilicueta, Rudiger, David Luiz, Alonso and finally Kepa behind the back four. Midfield consisted of Kante, Jorginho and Kovacic. Willian, Morata and Hazard formed the attack. 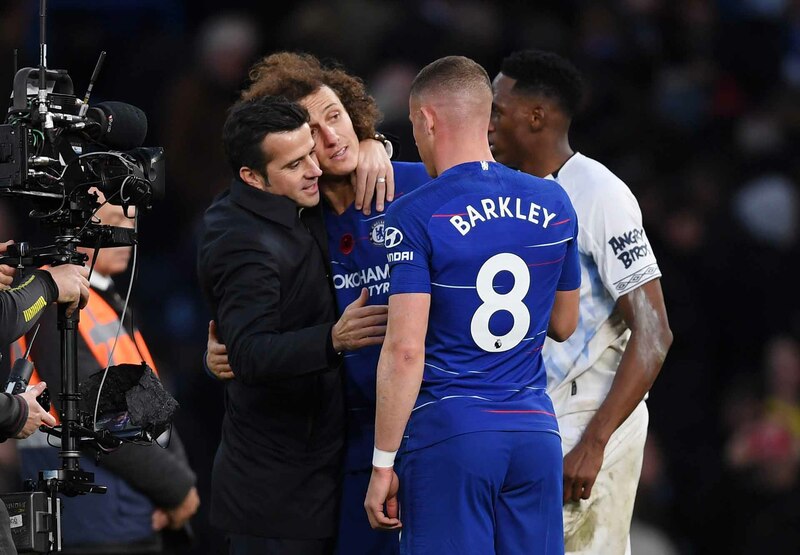 Ex-Everton player Ross Barkley was on the bench alongside Caballero, Zappacosta, Christensen, Fabregas, Pedro and Thursday night’s goalscorer Olivier Giroud. Everton’s line-up looked an attacking, pacey force with a spice of Barcelona. Former Barca players Mina, Andre Gomes and Digne started at Stamford Bridge. Richarlison and (regular frequent scorer against the Londoners) Theo Walcott ensured there was a quick front-line Chelsea had to be wary of. As with every Remembrance Sunday fixture at the Bridge, the Chelsea Pensioners from down the road led out the two teams with their wreaths of poppies. Bold letters with ‘Chelsea Remembers’ were held before kick-off along with the outstanding supporters flag being carried across the Matthew Harding stand. A well observed minute of commemoration was held to remember the fallen. Everton looked to start as the stronger side as Seamus Coleman got to the byline in the 2nd minute, crossing in but to a header away by Kante. Richarlison hit the follow up shot which was deflected out for a corner to the Toffees. Digne took it, and found Andre Gomes who got too much on it and went flying way over. The Toffees continued to start well with Coleman and Walcott linking numerous times on the right side. Chelsea were admittedly quite sloppy in passing and maybe not as quick in this as hoped. Everton were starting to take advantage of this by clearing the ball when passes in the final third were starting to become faster. A brilliant opportunity came for Chelsea as Hazard was brought down in the 22nd, with Mina getting booked for the subsequent challenge which resulted in a free-kick. The set-piece, not far from Jordan Pickford’s penalty area, had Alonso standing over it. The Spaniard struck the free-kick with fierce whip which bent to the side of the constructed wall. Pickford, dived to his right and seemed fortunate for a moment as the ball flew just wide of the post. The game started to get a bit feisty as Jorginho gained a booking also for bringing down Sigurdsson. The yellow card was actually the first for Jorginho since the start of the season. Quite an astonishing stat if you ask me! Everton got another chance in which it went high and wide of the Chelsea crossbar in the 30th minute. You could see the sense of frustration in the Chelsea players as Kante gained a yellow for a late challenge on Richarlison. Kevin Friend was maybe starting to be a bit yellow card happy despite the game not reaching half-time as yet. Chelsea clung on to the ball and maintained possession for a period whilst the Toffees kept their shape and were very disciplined in their defending. The best chance of the game fell to Alonso in the 40th minute, as the left-back volleyed from a tight angle with Pickford beating the ball away. It was one of those trademark Marcos Alonso shots with plenty of power from an acute angle. The initial cross came from a Willian free-kick in which Alonso spun the defence out making some crucial space to hit the shot. Alvaro Morata had another one of those penalty shouts where it was more of a coming together than an all clear penalty claim in the 42nd minute. Before half-time, Kevin Friend once more opted to be trigger happy with his yellows as he booked both Rudiger and Everton’s Bernard for a coming together in an off-the-ball altercation which was more of a silly tangle than fisticuffs. The whistle blew for half time, and you could say Everton certainly proved to be a tough outfit in the first 45 minutes, stretching and frustrating Chelsea. The Londoners on the other hand had to definitely be more clinical to gain the three points from this game. Chelsea came flying out the blocks in seconds – From kick-off the ball got to Hazard who crossed to Morata, the Spaniard then getting a half touch with Pickford stretching to turn the ball away in the end. Everton wouldn’t lie down despite this as Walcott nearly got a clean run on goal however his touch was too heavy in the 48th. Another chance came for the Toffees as Sigurdsson shot from 30 yards, however the ball came within line of Kepa who palmed it over in the 56th. At this point, the game started to feel as though it was becoming more of a spectacle on a knife-edge as both teams were starting to create very open chances either end. A carbon copy of Morata’s first penalty claim occurred in the 58th minute, however this time Digne did lay hands on Morata and the Spaniard appealed in disgust at the referee’s decision not to award a spot-kick. Almost a minute late Digne was almost clean through on goal but hilariously mis-controlled to ensure Kepa got a goal-kick. Willian not long after that then fizzed a shot low and hard across Pickford but the opportunity went just wide of the goal. Chelsea were really starting to crank up the heat. In the 61st, Hazard powered a shot from distance which fully tested Pickford, with the English keeper beating the ball away. The Blues were getting so close to that first goal. Hazard tried another blow by drilling the ball across Pickford which then hit the post and away in the 65th minute. Everton were starting to weaken at this point and you knew the away side were beginning to set camp for a draw. Their sharp attacking points were being blunted by Chelsea’s ruthless wave after wave attacks. An obvious sign of this was the inevitable delaying of the goal kicks. The Englishman was getting verbally slammed by the Stamford Bridge faithful for his frustrating tactics. Friend didn’t hesitate and booked the keeper in the end on the 73rd minute. Ross Barkley soon made an appearance in the 79th minute, replacing Kovacic. The Croatian didn’t have a miraculous game, however he gave a fair input. Some Chelsea fans may have liked to have seen more from him in this game. The Everton fans reaction was certainly more boos than there was applause. The Chelsea fans made their feelings clear by rising to their feet, applauding the returning England international. Straight after being introduced Barkley hoped to make an impact as a shot he took went completely wide and out for an Everton throw-in, at which the Everton fans rejoiced at. More frustrating times for Chelsea followed as Morata complained and protested himself into trouble, getting booked in the process by Kevin Friend in the 88th minute. It was fair to say this was just not Alvaro Morata’s day and one of them performances from him in which Chelsea fans felt despair of. Five minutes were added on at the ninety, however Chelsea were reduced to lumping the ball deep into Everton’s half. Each time the ball came back as Everton were assured in defence and done very well in clearing their lines. The final whistle blew as it felt almost like a defeat for Chelsea and an opportunity to catch Liverpool and Man City missed. Everton were good, however the Blues did have opportunities to ensure the game could’ve been taken away from the Toffees at some point. Onwards and upwards for the Chels..